Becoming a real estate agent requires a giant leap of faith and an investment of time and money. That’s why some agents may choose to test the waters with a part-time real estate position while hanging onto the steady income from another job. Industry veterans may also find that working for a part-time real estate agent salary provides an alternate or transition to retirement or a way to balance work and family life. Whether you’re looking into real estate career opportunities for a second job or brand new career, there are plenty of challenges to overcome on this nontraditional path. Despite your chosen work schedule, you’ll have to juggle clients who generally want their agents to be available around the clock. You should align with a broker for the office essentials and should operate like a full-time professional with clear expectations about your earning potential, said Valorie Easter, a Realtor in Charlottesville, Virginia. “If you work part-time you need to focus on generating business or going on appointments. Paperwork is not necessarily a money-maker,” Easter says. Dworshak believes working with an established team and administrative assistant is crucial to a new agent’s success. “If you are unavailable, your team member can make the appointment.” Of course, you will also have to split your commission and it takes a while to afford your own team and administrative assistant, he said. Needless to say you’ll have to make some sacrifices to earn a part-time real estate agent salary or commission. 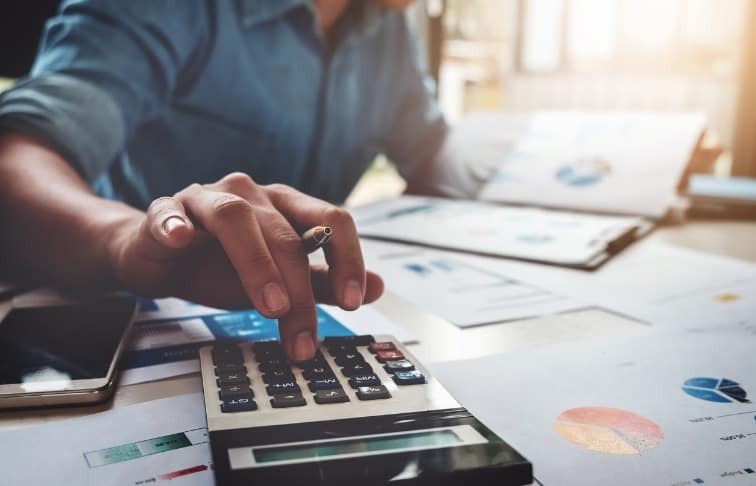 To start, you may have to give up some time off and vacations, especially if you’re the sole breadwinner in the family or don’t have supplemental income to support you while you learn the ropes or build your real estate business. You’ll also have to put up with the naysayers in the business who claim you can’t be effective part-time because of the commitment expected in the industry. How much is a part-time real estate agent salary? Agents generally work on commission, although some may earn a salary plus commission. It may take years to earn any money, says retired Realtor Lee Dworshak. He recommends agents be able to cover at least a year’s worth of living expenses before starting a real estate career. The costs to get a license and other fees could be about $2,000 the first year, said Dworshak, who retired from Keller Williams’ Los Angeles office. Determining how much you’ll make as a real estate agent is a big part of deciding whether the part-time salary is right for you or if there’s a different real estate career path you could pursue. 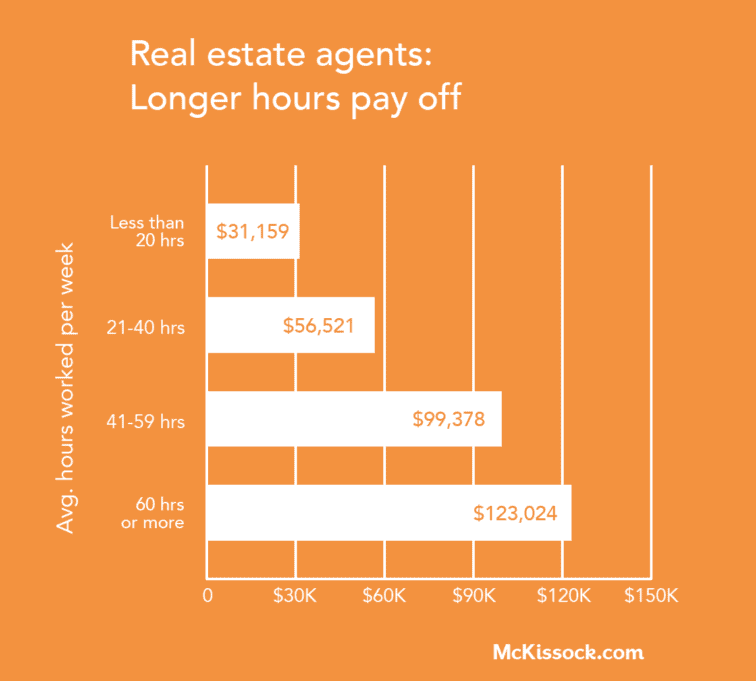 This graph, from our 2018 Real Estate Agent Income Guide, shows the average amount agents report earning based on how many hours they put in each week. Agents who commit less than 20 hours a week to real estate earn an average of $31, 159 annually. Part-time is definitely not the norm, but having a second career as an agent is common, according to the NAR member profile. Of members surveyed, only 4 percent reported that real estate was their first career; 16 percent had a previous career in management, business, finance, sales or retail. Dworshak was 53 when he started in the real estate business. He believes agents are more successful coming into the field with strong business skills. Certain fields lend themselves to being an agent or offer the flexibility to take on real estate as a side job, he said. Still, most Realtors worked 40 hours a week in 2015, a trend that has continued for several years, according to the NAR report. And the majority of members surveyed reported real estate as their only occupation: 74 percent of all members and progressively more with experience up to 86 percent with 16 years or more in the industry. For members who work fewer than 40 hours a week, 24 percent reported that real estate was their primary source of household income. That figure increased, too, with years of experience up to 33 percent with 16 years or more in the industry. Roni Robbins is a 30-year journalist with business, environmental, and real estate specialties. She wrote real estate articles for Mother Nature Network, the Daily Report, and Atlanta Journal-Constitution. She also reported for the New York Daily News, WebMD, and Adweek with stories picked up by the Huffington Post, Forbes, USA Today, and CNN. Find out more about Roni here.